Laparoscopic sleeve gastrectomy (LSG) is emerging as a primary procedure for the treatment of morbid obesity. 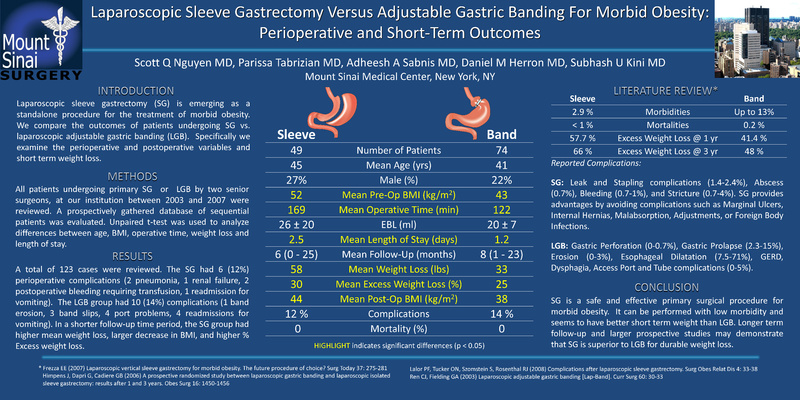 We compare the outcomes of patients undergoing LSG vs laparoscopic adjustable gastric banding (LAGB). Specifically we examine the perioperative and postoperative variables and short term weight loss. Methods: This study is a retrospective review of a prospective database of patients who underwent LSG and LAGB from 2003 – 2007. Results: One hundred twenty three patients underwent LSG or LAGB during the study period (49 LSG, 74 LAGB). The mean age was 42 years. There were 24% males. The mean BMI was 52 +/- 11 kg/m2 in the LSG group and 43 +/- 5 kg/m2 in the LAGB group. The LSG group had a longer operative time (169 vs. 122 min) and longer length of stay (2.5 vs. 1.2 days). There were no mortalities. The LSG had 5 (10%) complications and the LAGB group had 10 (14%) complications. The mean follow-up period was longer for the LAGB group than the LSG group (8 vs 6 mos). The weight loss is depicted in the table. The LSG group had a higher preoperative BMI and loss more weight. In a shorter follow-up time period, the LSG group had greater mean weight loss, larger decrease in BMI, and greater % Excess weight loss. Conclusion: LSG is a safe and effective primary surgical procedure for morbid obesity. It can be performed with low morbidity and has short term weight loss comparable to LGB. Longer term follow-up is needed. We also plan on examining postoperative quality of life with the two procedures.